Striding Through at Tumblr, too! Just a quick note to let you know I have launched a companion to this blog at Tumblr. I plan to use that one for quick interim posts, micro blogs if you will, but my detailed blogs will continue to be published here at WordPress. In any case, the Striding Through Tumblr blog is available at cmjhawk86.tumblr.com. It goes without saying the 117th running of the Boston Marathon will not soon be forgotten. As I finally sit down to compose my own race report from the day, I do so with the luxury of knowing the clear and present danger visited upon us by Messrs. Tsarnaev has been extinguished, and that the lone survivor of the two will now face justice. While I continue to feel terrible sadness from knowing nothing will bring back the three innocent individuals who died needlessly on Patriots Day, and that those injured in some cases face a tremendously difficult physical rehabilitation, I am filled with pride and gratitude for all of the authorities who were involved in this case. From the elected political leaders to the uniformed officers and EMTs on the ground, not to mention volunteers who stepped forward, the relentless focus, unity of purpose and quiet professionalism shown by all involved in the response was magnificent. They showed unequivocally that, nearly 12 years after 9/11, that it is indeed possible to take the high road to justice. And that truly makes me proud to call this country my home. Moreover, I can’t wait to toe the line again in Hopkinton next year. I will be back. That is, of course, a baseball phrase significant of when one’s favorite team finally leaves the comfy confines of Florida or Arizona to head north and start the regular season. But it also is a good way to characterize that time in a marathon training program where the “hard” or peak phase finally closes, followed by the taper and then the arrival onsite. 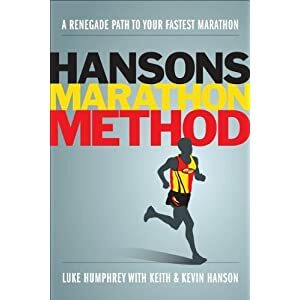 For this cycle I followed the Hansons Marathon Method (earlier training updates here, here, here and here), which feels easy at the beginning, but over time builds in intensity. By the time peak phase hits, so does the sensation of having been “sucked in” to a really rigorous program. The long runs in the program are shorter than most marathon training plans recommend, but the overall volume and amount of marathon pace running are very high, much higher than I had ever done in the past. Moreover, the taper is a very short one, only 10 days. When I did my final “tempo” run under the program – 12 miles with the middle 10 at goal marathon pace – I was right on target despite running in near freezing rain conditions. Then came the taper period. Here I try to maximize easy running and get good rest, but the latter of those evaded me for a number of reasons, mainly due to outside stresses such as events at work and so on. So when I got to Boston, I can’t say I was a rested as I wanted to be, but when I had a good night’s sleep in Boston on Saturday, followed by a nice casual 3-mile trot on Sunday, I felt as ready as I was going to be. On a side note, it was pretty cool getting to meet the great Meb Keflezighi in person at the expo. He’s not only a great champion but an incredibly gracious gentleman. Later that night I got to meet Bill Rogers, who wished me luck in the race. 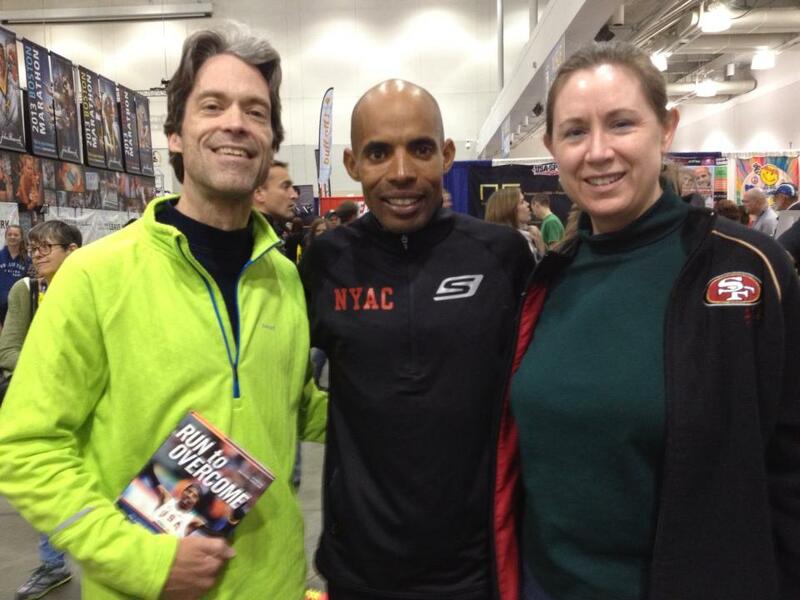 Lynn and I get to meet Meb Keflezighi at the Boston Marathon Expo. I slept fitfully Sunday night, then woke up feeling a bit dehydrated. Maybe the room’s ventilation system dried me out, I don’t know, but I quickly set about rehydrating as I consumed my oatmeal and energy bar. After breakfast I dressed quickly and was on my way to Boston Common by 6:15am. I arrived there to find only short lines for the buses; the big crowds would soon follow. I boarded a bus, chatted a little bit with a guy who stayed in the same hotel as me and browsed Facebook on my phone. I got to the athletes village and after all the water I drank upon getting up, desperately needed to make a pit stop, which of course meant waiting in a line. I guess my efforts to rehydrate went well, because I would visit the port-o-john twice more before departing the village. By the time I was due to begin making my way to the start I felt relaxed and ready to go. I was in the first corral of Wave 2 this time and that meant being held back for a while on Grove Street while the first wave took off. Then we moved forward and took our places. As we lined up, I couldn’t help feeling a little amused by being at “the” Boston Marathon and being able to line up so close to the actual start. I mean, I could even see the starter, the emcee, the motorcycle cops. It felt like a little taste of eliteness, just a tiny bit. As the clock counted down I did my usual relaxation exercises and reminded myself, “easy out of the gate.” I knew some people would fly out of that start and I didn’t want to be one of them. At the same time, I was also cognizant of the aggressive goal I had in mind of 3:10. At some point I would need to turn it up a notch and get after it. True to my plan as we headed across the line I stayed relaxed and ran a 7:22 first mile while getting passed by many who rocketed down the hills. I knew I’d see some of those folks again soon. And so it went for me over the next several miles. I stayed for the most part a little bit off my goal pace, though I did drop a 7:13 in Mile 4. For the most part I tried to just stay in a positive frame of mind, smiling, waving to some friendly spectators and just enjoying the scenery and pageantry of this great race. I decided the real race for me would begin after 13.1 miles. As I came through scream tunnel at Wellesley, no kiss stops for me, I had work to do, but I began to gather my strength for that halfway point while the energetic young coeds pushed me to a 7:16 mile. I had this race right where I wanted it, I thought. Before long we passed through the half marathon point. I passed through it in 1:36:47, on pace for a 3:13. At this point while I wanted to start racing hard, I also had to be honest with myself about how much I had left. Could I pick it up more? Or was I already overextended? I still felt good but I also knew the hardest part of the course was yet to come and the early downhills had already worked my quads hard. I pressed on and stepped it up enough to reel in a number of runners who had been ahead of me the entire race. Most of them went out too fast and wouldn’t see me again. As the first of the Newtown Hills came into view I still felt strong even while the first walkers started showing. I was passing people right and left, but when the 25k split (1:54:42) came up, my pace hadn’t picked up at all, despite how hard I was now working. Determined, I dug in harder and tried to find a little more, but at 30k (2:18:23) the result was the same. With Heartbreak Hill still to come it was clear that today would not be my day for a 3:10. But a PR and breaking the dreaded 3:20 plateau that has tormented me for 5 years was a very real possibility. I am now in my usual post-marathon recovery phase, two weeks of no running at all. Moreover, a severe spring allergy attack has gone the extra lengths to enforce that ban. But it has given me time to reflect on this most unusual of marathon experiences and the roller coaster of emotions it brought on. The competitor in me is still hungry to run a better marathon – and to be sure I’ll probably pore over the training data from this and other marathons to figure out how to get there – yet I am reminded of how lucky I was to get to finish the race. The fact I did is a random matter of timing, nothing more. And throughout the rest of this year, be it a small DC Roadrunners Club race, Marine Corps Marathon this fall, or Boston next year, I will run with the bombing’s victims in my heart. Because no one ever really runs alone. 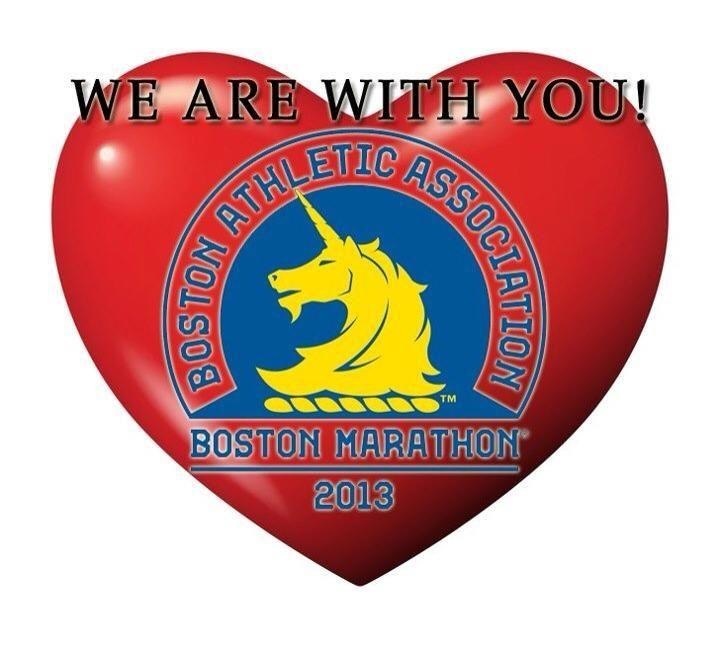 Please donate to the One Fund Boston if you can. It’s been a longer time away from posting here than I expected but I’ve been busy on a lot of fronts. The biggest consumers of my time have been an increasingly awkward situation at work, which I won’t get into here, and my laserlike focus on training for Boston, which of course is what I will discuss. However, for now just a teaser, because I have one more final workout tonight to build my Boston resume, a 12-miler with the middle 10 at marathon pace, or what the Hansons plan calls “tempo.” After tonight’s run the taper phase finally begins; Hansons keeps the pedal to the metal a lot longer than other plans. Regardless of how it goes tonight, I feel good about my preparation. It’s the first time I have ever tried the Hansons plan but I really feel strong right now. The last time I felt this good was in 2010 heading into Boston, and that’s where I set my current marathon PR. I’ll lay it all out after tonight’s workout, but the bottom line is I like my chances of PR’ing for a second time in Beantown. If you’re interested in tracking me on Patriot’s Day, it’s bib #9712. It’s been a little over a month since I initiated my Boston Marathon training cycle using the Hansons method. And I have to say while the approach has been a bit unorthodox I have enjoyed the change. When I started training up in mid-December I was rather surprised by how “easy” it was in the initial weeks. There were no long runs, no speed, just a lot of easy 3, 4 and 5 milers. While according to the book it is permissible to add more volume to easy runs to boost mileage, I stayed away from doing this for the first two weeks and stuck to the prescribed numbers. But by the time Christmas rolled around I was ready to start experimenting. The longest runs in the plan at this point had still only reached about 5-6 miles, but I cruised easily through a 9-miler with a buddy on the 28th. Then the next day, I introduced another tweak. I have no idea whether the Hanson brothers would approve of this, but I didn’t ask for permission, I just went with my instincts which said it was time to start introducing a tiny little bit of quality work. I did this in the form of a progression run, tearing a page out of the McMillan library. Out of respect for Hansons’ start-slow approach, I took this step modestly with simply a marathon pace mile at the end of a planned three miler, followed by a one-mile cooldown. Since then, I have added more work to the weekly progression run, while the weekly mileage has also slowly crept up into the 30s. Throughout this whole mesocycle I have felt that despite the small weekly mileage totals that my fitness was building in a very discernible way. But until today I hadn’t really had an opportunity to test that belief so I set out for a “tempo” run (Hansons version of tempo is actually marathon pace run). It was a fairly warm day for January at 49 degrees and humid thanks to a perpetual fog that has hung over the nation’s capital the past several days. Perhaps I was a bit excited to finally do a “real” quality workout, because I put down a first mile much faster than my typical warmup at about 7:36. Then in the next mile, when it was time to work I quickly found myself heading down a long hill. I decided to just the hill take me down while I worked to stay over my center of mass and the result was a 6:32 mile that felt no harder than the first mile. Over the next two miles I cruised over flat bike paths and that provided an opportunity to finally locate a pace close to the target of 7:15 per mile. Then in mile 4 came the inevitable correction for that big downhill mile earlier as I had to work up a very long climb that I hadn’t run in several years. However, the drop-off was only into the 7:30s, and that was then followed by two more quick miles at MP. After passing 6 miles I decided to keep it going for a 10k marker, which I hit at 45:11, for an aggregate pace of 7:17/mile…not quite 7:15 but right in the range and a very good place to start. Full run stats and log report are posted here. All of which leads into the plan’s sixth week, where the intensity visibly ramps up. The first track workout is this week, as well as another MP run later in the week. After today, I feel like I am very much ready for the step-up. This next mesocycle will be one jammed with hard work as it approaches 60 miles per week, but when I come out of it I should be well positioned for the Club Challenge 10 Miler in Columbia, MD, which will serve as my benchmark race. More on that in 6 weeks or so. Now it’s time to get some rest! With yesterday’s little 45 minute spin workout on the trainer I put the wraps on an interesting 2012. I ended up with the lowest total run mileage in quite a while with just over 1300 for the year. But I also cycled over 800 miles and swam 22.5 miles. Some of the decrease in run mileage is attributable to a couple of nagging injuries in the early part of 2012, and some of it is due to introducing more intense bike training during the summer when I was training for the 2XRip Duathlon. Nonetheless when it came time to run the Chicago Marathon in the fall, I was ready; if anything I felt like the varied training brought me to the windy city stronger than I had been in a long time. Lesson to be learned from it? I think so. Clearly varying my training is something that works for me. Biking in particularly keeps my cardiovascular strength at a high-performing level while easing some of the stress on my joints, especially the knees. Even now as I start on a Hansons program in preparation for Boston, I plan to leave a little room for the bike. I am also considering getting back in the pool, if I can fit it into my busy schedule. Cross-training is an essential part of my training, and besides, I haven’t ruled out another duathlon or maybe even an Olympic triathlon someday. One of the more disappointing aspects of 2012 was the lack of any new PRs. That is, of course, except for the automatic PR earned at my debut duathlon. I thought Chicago for sure would be that kind of a day and I felt fantastic during the race, but at the finish I found myself two seconds shy of the marathon PR I set in 2010 at Boston. Still the fact that I cruised so easily to that result at Chicago leaves me encouraged that with solid, consistent training I can get that time down at Boston in 2013. Yep, I hit the almost half-century mark today, which didn’t keep me from logging four miles and hitting the weights for a bit. It will be fun to see what the year ahead holds. Either way, I’m looking forward to it. Boston awaits as do many other fun challenges. Bring it on! With my recent offseason break, followed by a frustrating foray back into racing at the Gar Williams Half Marathon at Carderock this past weekend, it’s time to put a wrap on 2012. Gar Williams wasn’t the way I wanted to end the year, that’s for sure. It was supposed to be just a training run at far less than full intensity, given I was just ramping back up to running. On top of that the C&O Towpath, on which this entire race was run, was muddy and slippery after a night of hard rain. But when the horn sounded I foolishly took off as if I was in top form. Needless to say I couldn’t maintain anything close to that pace and even bonked at around 10 miles, sheepishly slogging home the final 5k at around 9:00/mile pace, dropping from 19th overall to 29th, and finishing in 1:39:36, or about 8 minutes slower than I ran at Philadelphia just three weeks ago. So what did I learn from the experience? Well, first of all, that you can lose a lot of fitness even over a short break. Second, not to be an idiot and run as if you are in peak condition when you are not. Third, it is possible to crash and burn in a half marathon the same way as a marathon if you are not properly trained. And fourth, running a race that long isn’t worth the post-race recovery issues if you don’t approach the race properly and/or fail to stick to the plan for the day. So now I go through a few days of recovery and rehab, mainly because my right calf is still screaming at me, hoping that I will be able to start marathon training as scheduled next week. Most likely I will be fine for that goal, but it has been a humbling couple of days. So about that training. I’ m looking to get into it, and for this cycle I am actually going to try following somebody’s else’s instead of using my own home-brew method. Doing my own thing hasn’t been bad; it has, after all brought me across 9 marathon finish lines. But there is a nagging feeling I can do better. The McMillan pace conversion table, for example, shows that based on my times at shorter distances, I should be able to run around a 3:10 marathon, but I never been able to crack 3:20. I have 5 results between a PR of 3:20:41 and 3:23:52, so the consistency is there, but so is the plateau. Unfortunately, high mileage plans such as Pfitzinger are not for me, though; the times I have tried to push the mileage numbers up to similar levels I have ended up injured. I need something else, something that will get me ready to run at my desired marathon pace for the whole distance while not taxing my joints too much and hopefully allow me to still squeeze at least some of the cycling and swimming I depend on for cardiovascular endurance. So I will give the Hansons a shot. I should be clear that despite the lower prescribed mileage numbers, this is still a pretty intensive plan, even using the “beginners” plan as I intend to do. As for why I chose beginners, my reasoning is threefold. 1) the mileage numbers correspond well to what I have been doing, offering a slight increase; 2) the plan ramps up gradually enough that I can continue to cross-train as an “optional” activity under the plan, particularly during the early weeks (1-5); and 3) there is enough flexibility built in that I can squeeze in a tuneup race or two along the way. Actually I had been planning to run about 5 races in the club series, but I am now backing off of that a bit. I think 2 races is probably the most I will do prior to Patriot’s Day in Boston. In short, I want to give this plan a chance to really work, and that means following it as closely as I reasonably can. The early aspects actually seem a little too “easy” given my background but the plan is designed that way, so that before you know it you’ve been lured into something where you now are working really hard. By the time I hit peak I will be at probably the highest intensity I have ever been in a marathon cycle. The 18-week plan starts next week. Until then, I just need to shut this calf muscle up. Offseason in a sport that doesn’t have one? After Philly, I have decided to shut it down for a couple of weeks. I’m not injured or anything, but the cumulative fatigue of the fall had me just feeling like it was time for a little break. I know for some runners, the very thought of an “offseason” is sacrilege. And the race calendar certainly makes it easy to buy into the “there is no offseason!” mantra. Even now as turkey trots pass the baton to jingle bell jogs, it’s possible to keep racing right on through it all. But to what benefit? Surely these aren’t target races, and nobody can race at top form all the time. If you try to do so, you eventually end up on the sidelines before the real target races in the spring. For me, that’s Boston, a race which always demands one’s best. So it’s a pretty simple decision really. Two weeks off now may drive me a little stir crazy but sets me up well for a little pre-holiday base building and even some low-key non target racing; after all I still have DC Roadrunners Club race series points to pick up. Meanwhile I am also reading up on potential training plans. I have no conclusions yet on what to follow, if any — I usually end up designing my own — but that’s the subject of another post. Then a 16 week cycle leading up to Boston starts the week of Christmas. By then I will be chomping at the bit, ready to roll. The long fall season finally came to a finish yesterday at Philly, and I wanted to make it close out with a big result. But in the end I settled for something less than the PR I was seeking, although it was still a very solid result. I also used the race as a reason to put some money towards Superstorm Sandy relief efforts, which coexisted nicely with the 1700 New York City Marathon refugees that the Philly organizers allowed into yesterday’s race. 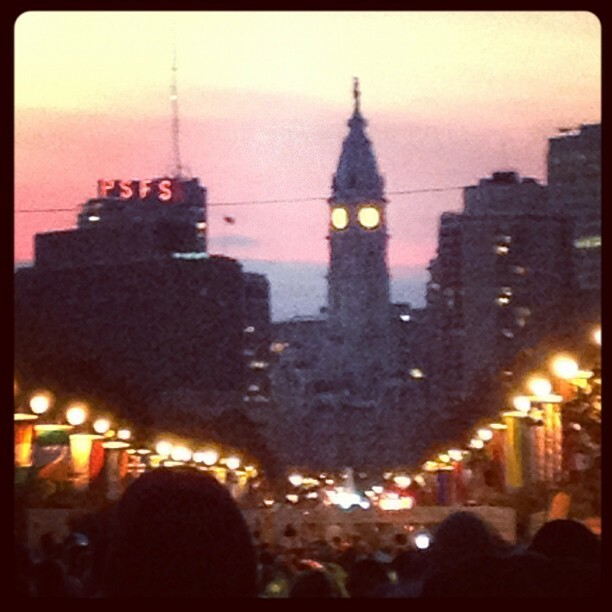 Sunrise on Ben Franklin Parkway, with a few thousand nervous runners in the foreground. Leading up to race day I had a solid taper week. When I did my last bit of tempo work on Wednesday I hit 6:30 paces easily and that had me feeling confident. All I needed to do was get myself up to Philadelphia and run. But first I had to get through a very busy week at the office, and the long hours didn’t do wonders for my sleep cycles. Still when I got up Sunday morning I felt ready to go. I headed out of my brother’s house in Roxborough at about 5:20 am and got down to Center City easily, before most of the traffic would arrive. That gave me plenty of time to walk casually up to the start area, visit the port-o-potty and warm up a little before checking my gear. As I stripped down to my singlet and arm warmer sleeves it felt really chilly, more so than at the Windy City 6 weeks ago. But of course once I got in the corral and it filled up with other runners, that sensation ceased. The cannon went off a little after 7am and being in the maroon corral I crossed the start seconds later. The first 2 miles at Philly are always a little bit chaotic; it’s crowded and you have to negotiate some tight turns at Logan Circle and then again in Old City. Through those miles I was 6:47 and 6:45, actually a little bit slower than I wanted to be (6:40). In mile 3 heading south down Columbus Boulevard I was a 6:39 and that had me feeling like I was in a groove. I slipped back into the 6:50s though as we started heading back towards Center City and the long stretch on Chestnut Street. When I hit 7 miles there things were looking good again, only to slow again in Mile 8 as we started climbing up 34th Street towards the Philadelphia Zoo. And so it would be today, a roller coaster ride of sorts. It was becoming clear to me this was going to be a day where any PR was going to be difficult and that more likely I would be just fighting for the best result I could get. I don’t know if the cold conditions had something to do with it but it seemed all the way through that my energy level was just not high enough for what I wanted to achieve. I kept asking myself to give more, to dig deeper but I knew the 1:27 goal was out of reach and the 1:29:03 PR was slipping away. That was confirmed when the 3:00 marathon pacer caught me just past the 8-mile mark. Three years ago, that same pace group didn’t catch me until 10 miles, and then when it did I stepped up my pace and ran away from it. This time I could put up little resistance, though I held out hope that maybe I could make it up with a strong finish. Next I was caught by DC Roadrunners club teammate and club president Brian Danza; we chatted a bit before he moved ahead en route to a 3:04 marathon. Perhaps that chat helped motivate me to a 6:53 9th mile. Mile 10 is by far the toughest mile on this course, as it takes runners up a long steep climb in Fairmount Park. In the years when I have run the marathon here, I haven’t had to worry about it too much; it’s just one hill on a 26.2 mile course. But in a half marathon, when I’m running significantly harder it’s a much stiffer challenge. Sure enough I fell back badly here, logging my slowest mile of the day in 7:26. Ouch. Then it was downhill out of the park to MLK Drive and a turnaround leading to the 11 mile mark. I started thinking of it as “just a 5k” and tried to step it up again. Things got a little better but I was still on the wrong side of 7 minutes per mile at 7:04. As I passed 11, the time for excuses was gone. There was open road ahead of me and work to be done. So I pulled out to the right, away from the crowd and got busy. The fight was still in me, even if I was tired. I went through mile 12 in 6:50, my best split in about 5 miles. I was laboring but I was going to finish strong, no matter what. As we crossed back over the Schuylkill River, past the art museum and towards the finish on Ben Franklin Parkway, I pushed as hard as I could. I took one last peak at the watch on Eakins Oval and knew there was no way I would break 1:31 but I was determined to make the best of it. As I crossed the line in 1:31:37 I knew I had given all I had for the day. And that is really all you can ask for. So…it wasn’t the spectacular result I had craved but it was a very solid finish, my best half marathon time in over two years and an age graded result of 71.2%. Perhaps that means I am on the cusp of something big in 2013. We shall see. But first it’s time for a little off-season break, a couple of weeks to recover from a season that included a marathon and half marathon only 6 weeks apart from one another. By late December I will no doubt be chomping at the bit to start training for Boston.